The craziness that is Hallowe’en has just passed, followed quickly by the craziness that is the lead-up to Christmas. Shops immediately filled their shelves with decorations and children started talking excitedly about their Christmas wish lists. Meanwhile, an incredibly important day falls quietly in between these two celebrations. I’m not an advocate of war and I fail to see glory in it, but I do admire the courage of all soldiers and the sacrifices they and their families made and continue to make. I am where I am today in large part because my grandparents and some great-grandparents and millions of others served in wars. So every year, we commemorate Remembrance Day by setting up a display in the living room for a week before November 11th. 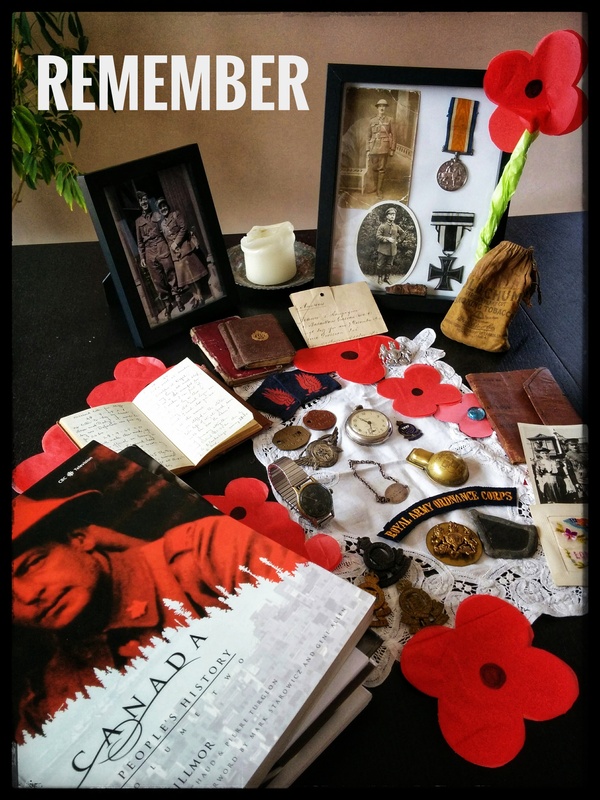 The kids cut out poppies and we lay out all of the memorabilia we have from our ancestors as well as books about war. Sometimes I’ll read a passage to them from my grandfather’s WWII war journal or a chapter about a particular battle. I try and hide the minor heart attack I experience every time one of the kids reaches for a delicate war journal or medal with their grubby little hands. Their curiosity with the tangible mementos in front of them lead to so many questions and fascinating discussions. I am constantly adding to our little collection thanks to the wealth of digitized historical military content on the Internet. This year, one resource in particular has been a gold mine of information for us and if you also have Canadian roots with an ancestor who may have been involved in World War I, you will want to visit the Library and Archives Canada (LAC) Soldiers of the First World War page. 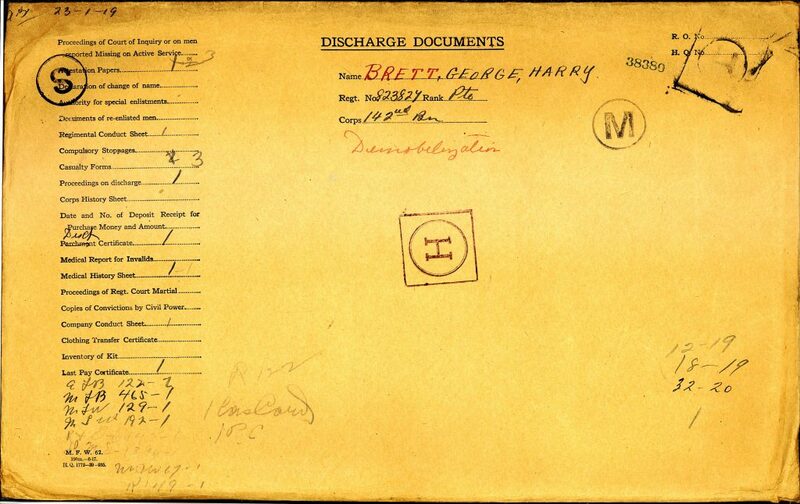 They’ve almost completed digitizing 640,000 service files of members of the Canadian Expeditionary Forces, including my husband’s great-grandfather, George Henry Brett. LAC carefully slipped out over 60 pages of George’s records from a fragile manila envelope and then removed any staples so they could properly digitize everything. The result was a tidy 63-page PDF file that I downloaded in seconds. There is information about his appearance (he was 5’11”, had a chest girth of 39″, a fresh complexion, grey eyes and dark brown hair), his address, occupation (he was a candy maker, which my kids are very happy about! ), family members, medical records (he sustained a foot injury at Vimy Ridge, which may have been caused by the mysterious piece of war shrapnel that has been passed down to my husband), pay stubs, service history and much, much more. Searching this database for an ancestor is straightforward and LAC also offers records covering many other types of Canadian Military Heritage. Even if you don’t have any family members in their database, it’s worth glancing through some of the files, if only as a way to remember some of those soldiers who served for us over a hundred years ago. ← Is Family History Boring?